The meaning of Agurtzane is 'Rosary. This is the Basque equivalent of the Spanish Rosario.' The name.. The meaning of Ainara is 'Swallow.' The name Ainara comes from the Basque origin and is primarily gi.. The meaning of Ainhoa is 'Allusion to the Virgin Mary.' The name Ainhoa comes from the Basque origin.. The meaning of Ainoa is 'She who has fertile soil.' The name Ainoa comes from the Basque origin and .. The meaning of Aisone is 'A form of Asuncion.' The name Aisone comes from the Basque origin and is p.. The meaning of Aitziber is 'Refers to the Virgin Mary.' The name Aitziber comes from the Basque orig.. The meaning of Alaia is 'Happy, of good cheer.' The name Alaia comes from the Basque origin and is p.. The meaning of Alazne is 'Miracle.' The name Alazne comes from the Basque origin and is primarily gi.. The meaning of Alesandere is 'Feminine form of Alesander.' The name Alesandere comes from the Basque.. The meaning of Alodia is 'Free land.' The name Alodia comes from the Basque origin and is primarily .. The meaning of Amaia is 'End.' The name Amaia comes from the Basque origin and is primarily given as.. The meaning of Arantxa is 'A form of Arantzazu.' The name Arantxa comes from the Basque origin and i.. The meaning of Arantzazu is 'Are you among the thorns.' The name Arantzazu comes from the Basque ori.. The meaning of Aranzazu is 'Are you among the thorns.' The name Aranzazu comes from the Basque origi.. The meaning of Argia is 'Light. Note that Argi is masculine. Argia is feminine.' The name Argia come.. The meaning of Arrate is 'Refers to the Virgin Mary.' The name Arrate comes from the Basque origin a.. The meaning of Arrosa is 'Rose.' The name Arrosa comes from the Basque origin and is primarily given.. The meaning of Aurkene is 'Presentation.' The name Aurkene comes from the Basque origin and is prima.. The meaning of Bakarne is 'Solitude.' The name Bakarne comes from the Basque origin and is primarily.. The meaning of Balere is 'Basque form of Valerie.' The name Balere comes from the Basque origin and .. The meaning of Begona is 'The place of the dominant hill.' 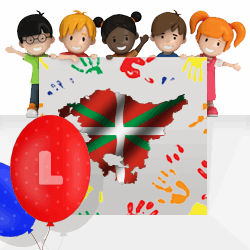 The name Begona comes from the Basque ori.. The meaning of Benate is 'A form of Bernadette.' The name Benate comes from the Basque origin and is.. The meaning of Betine is 'A form of Perpetua.' The name Betine comes from the Basque origin and is p.. The meaning of Bibine is 'A form of Viviana.' The name Bibine comes from the Basque origin and is pr.. The meaning of Birkide is 'A form of Bridget.' The name Birkide comes from the Basque origin and is .. The meaning of Bixenta is 'Variant of Bizenta.' The name Bixenta comes from the Basque origin and is.. The meaning of Bizenta is 'Feminine form of Bingen.' The name Bizenta comes from the Basque origin a.. The meaning of Danele is 'Feminine form of Danel. God judges me. Judged by God.' The name Danele com.. The meaning of Deiene is 'Annunciation.' The name Deiene comes from the Basque origin and is primari.. The meaning of Deikun is 'Annunciation.' The name Deikun comes from the Basque origin and is primari.. The meaning of Donetsi is 'A form of Benita.' The name Donetsi comes from the Basque origin and is p.. The meaning of Edurne is 'Snow.' The name Edurne comes from the Basque origin and is primarily given.. The meaning of Eguskina is 'Sunshine.' The name Eguskina comes from the Basque origin and is primari.. The meaning of Eider is 'Beautiful.' The name Eider comes from the Basque origin and is primarily gi.. The meaning of Enara is 'Swallow.' The name Enara comes from the Basque origin and is primarily give.. The meaning of Estibalitz is 'Sweet as honey.' The name Estibalitz comes from the Basque origin and .. The meaning of Floria is 'A form of Flora.' The name Floria comes from the Basque origin and is prim.. The meaning of Garaitz is 'Victory.' The name Garaitz comes from the Basque origin and is primarily .. The meaning of Garaitza is 'Victory.' The name Garaitza comes from the Basque origin and is primaril.. The meaning of Gechina is 'Grace.' The name Gechina comes from the Basque origin and is primarily gi.. The meaning of Gexina is 'Graceful.' The name Gexina comes from the Basque origin and is primarily g.. The meaning of Goratze is 'A form of Exaltacion.' The name Goratze comes from the Basque origin and .. The meaning of Haizea is 'Wind.' The name Haizea comes from the Basque origin and is primarily given.. The meaning of Iciar is 'Name of Virgin Mary.' The name Iciar comes from the Basque origin and is pr.. The meaning of Iiragarte is 'A form of Anunciacion.' The name Iiragarte comes from the Basque origin.. The meaning of Ikerne is 'A form of Visitacion.' The name Ikerne comes from the Basque origin and is.. The meaning of Iosune is 'A form of Jesus.' The name Iosune comes from the Basque origin and is prim.. The meaning of Iragarzte is 'Annunciation.' The name Iragarzte comes from the Basque origin and is p.. The meaning of Irakusne is 'A form of Estefania.' The name Irakusne comes from the Basque origin and.. The meaning of Iratze is 'Reference to the Virgin Mary.' The name Iratze comes from the Basque origi..